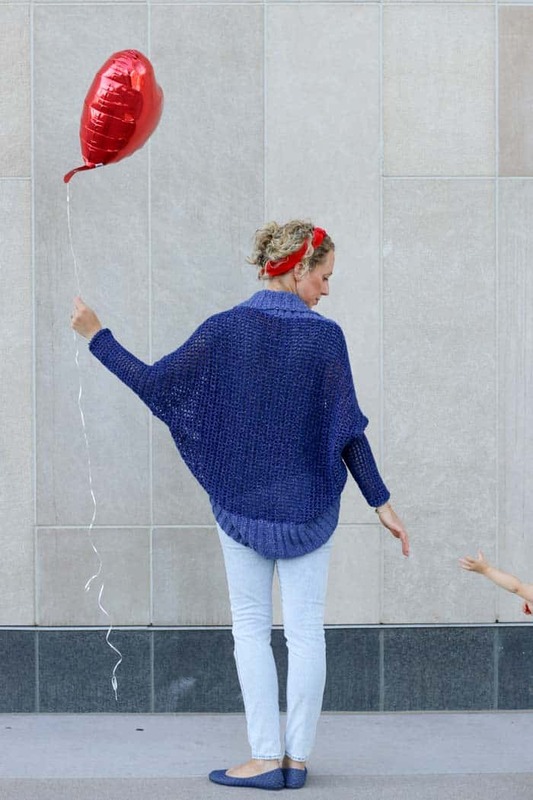 Don’t let the dolman sleeves and modern silhouette fool you, this easy crochet shrug pattern is constructed with basic stitches and simple shapes. Great sweater for confident beginners! Find the entire free pattern below or purchase the ad-free, printable PDF for $2.75 here. 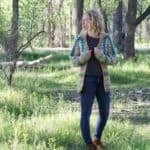 This free crochet shrug pattern is part of an ongoing collaboration with my friends at Lion Brand. This post contains affiliate links. Oh boy am I excited to introduce you to a new friend. She’s easy to work with, she won’t have a lot of high maintenance requirements of you and she is just one of those classic beauties. I think you’ll love her as much as I do. When this yarn arrived in the mail, I felt a little overwhelmed by all the possibilities. I asked on Instagram what you thought I should make and my favorite idea by far was the tongue-in-cheek suggestion of crocheted adult overalls. 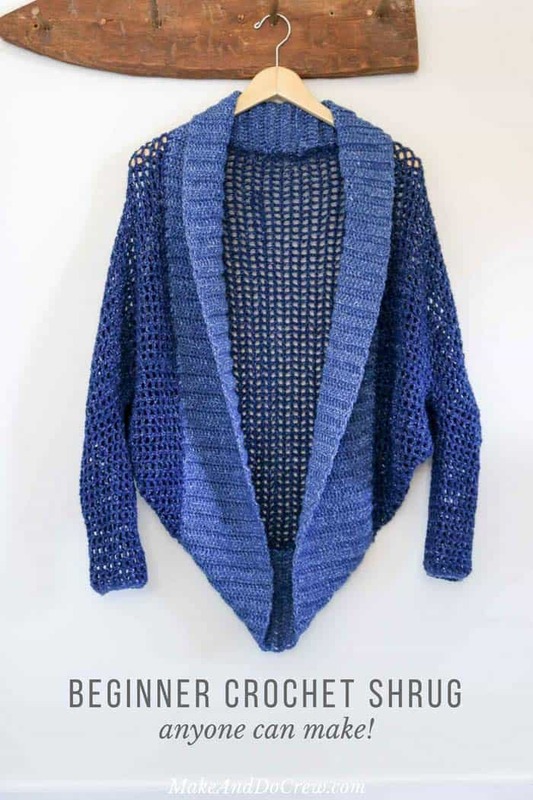 Unfortunately, a full yarn pantsuit would have taken me until Christmas 2021 to make, so I’m offering this easy crochet shrug as an alternative. As it was, my mom still had to be my crochet wing-woman and help me finish the last part of this shrug collar so I could publish the pattern this week! And if you’ve read this far, I’m going to reward you with a photo that basically summarizes the family terror and drama that accompanies any Make & Do Crew photo shoot with my husband and kids. A massive gust of wind caught us by surprise and my husband just happened to photograph the exact moment I saw all our balloons go sailing off into the sky. Ha! I just have to laugh at the chaos that is my family/work life. Pin this free pattern for later here. Don’t let the dolman sleeves and modern silhouette fool you—the construction of this on-trend sweater is super simple! 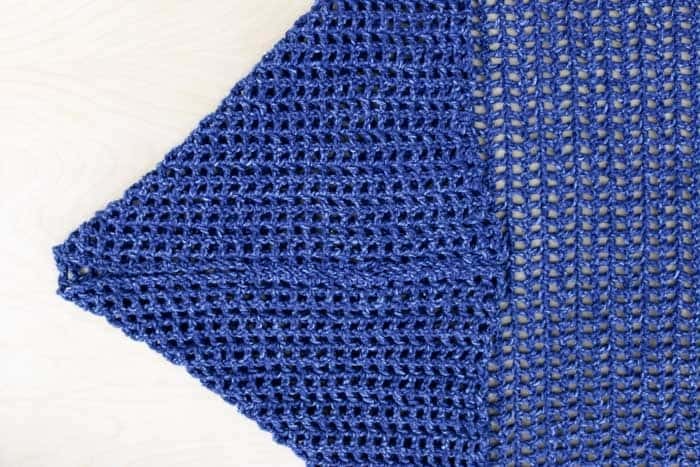 You’ll work one large rectangle in a mesh pattern using only double crochet and chains. 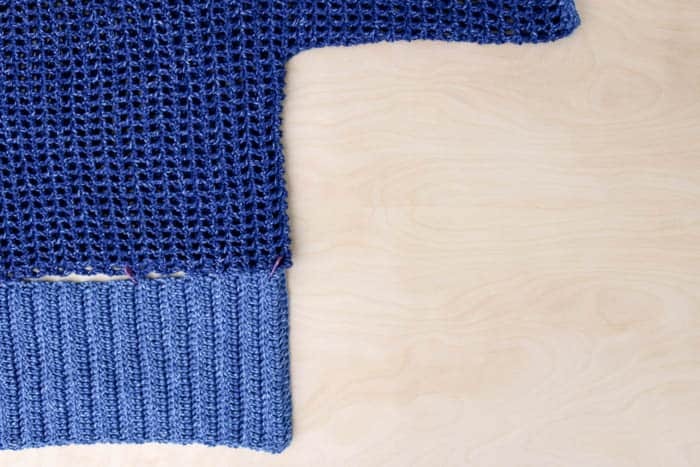 After seaming the rectangle in half, you’ll add sleeves, again using only basic stitches. Lastly, a long rectangle made from the accent color will be added to form the wide collar and edging. This pattern is easily customizable. Notes are included in each section on how to adjust sizing. Sample pictured is a size S/M. See photo below for additional measurements. Purchase the full kit for this pattern from here! • Pattern includes sizes S/M and L/XL, but you can easily adjust the size of this sweater to suite your body. Notes are given throughout on how to customize. When stitch counts are mentioned, size S/M is given first with L/XL following in parenthesis. 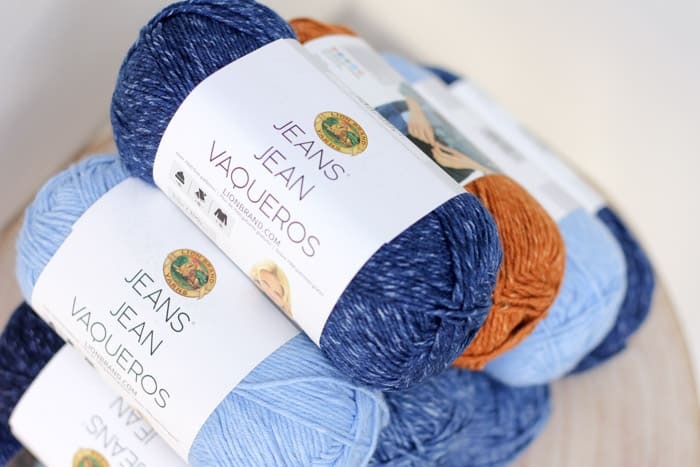 • Please note that if customizations are made, the amount of yarn needed will differ from what is called for above. • Ch 3 at beginning of row counts as 1 dc throughout pattern. • See comments at the end of this section on how to modify the rectangle measurements if desired. Foundation Row: Using MC, Ch 112 (128). Row 2: Ch 4 (counts as 1 dc and 1 ch), sk first dc, sk first ch, *dc in next dc, sk next ch, ch 1; rep from * to last ch, dc in tch; turn. Repeat Row 2 69 (79) times until there are a total of 71 (81) ch1sps vertically. To customize the length of the sweater: Measure from the top of your shoulders down your back to wherever you’d like the sweater to end. Subtract 7” (8”) for the border. The remaining length is how long you should make your chain for this rectangle. Begin with an even number of chains. To customize the width of the sweater: When draped across your back horizontally, the rectangle should hit at or right past your elbows. Work Row 2 additional times if desired. To customize: Try on sweater to see if this armhole sizing suits you. Increase or decrease number of ch1sps included in arm hole if desired. 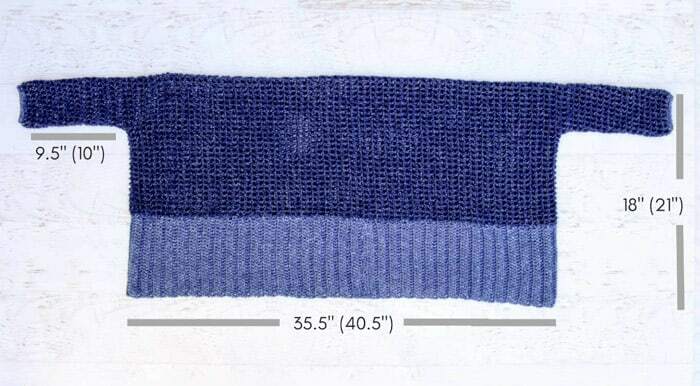 • Sleeve length can be easily customized by working more or fewer rounds of the same mesh stitch. • The sleeves are worked in the round. Do not turn at the end of each round. With RS of sweater facing, attach MC in newly created seam at underarm. Rep Round 1 17, (18) more times until there are a total of 18, (19) ch1sps in the length of the sleeve. Fasten off. Attach AC in any ch1sc around sleeve. Round 1: Ch 1, sc in same sp, sc in each ch1sp around sleeve, sl st to first sc to join. Round 2: Ch 1, sc in each sc to end of round, sl to to first sc to join. Fasten off. To customize: If cuff (Rounds 2-3) feels too restrictive to you, do not sk dcs and instead sc in both the ch1sps and the dcs around sleeve. 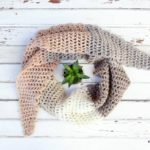 • The collar is worked in double crochet through the back loop only (dcblo), which is exactly like double crochet, but you’ll work the stitches through only the back loop of the dc from the previous row. • To check gauge of collar, measure rows against the edge of sweater. Each collar row should be approximately the height of one ch1sp in the sweater. Foundation Row: Using AC, Ch 30 (35). Repeat Row 2 140 (160) times for a total of 142 (162) rows. To Seam Collar: With a doubled strand of AC and a tapestry needle, seam the foundation row and the last row of the collar together using the mattress stitch. Take care not to twist the collar. To Seam Collar onto Shrug: With RS of shrug facing you, position collar seam at back of neck. (There isn’t really a top or bottom of the shrug, so whichever side gets the collar seam will become the neck.) Use stitch markers or safety pins to pin collar to shrug, aligning one ch1sp in the shrug with one row of the collar. You may find that you don’t care to pin the collar all the way around, but rather just align each row and ch1sp as you seam. With a doubled strand of MC and a tapestry needle, seam the shrug and collar together using the mattress stitch. Avoid joining extremely tightly so that seam is able to accommodate a small amount of stretch when the sweater is worn. Pop on your new completely handmade sweater and head out to find James Dean, you all-American DIY-er, you! Happy stitching to you, Jess! I’m always awed by how you turn something so simple into something awesome. Thank you so much for your inspiring and easy to follow patterns. Makes this 70 year old lady want to crochet more. Oh, Sandy, I just love hearing that! 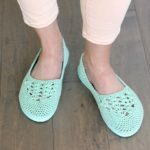 Thank you for letting me know you’ve gotten the crochet bug too! I would love to knit this. do you have a similar pet tern done for knitters. For the notes on how to adjust the width. It says that the width should reach your elbows. Does that mean if my arms are stretched out and two both elbows? Await can’t find the jean yarn ,. What could I use in place? Love the pattern. I love this pattern so much. I have a question on the ribbed Collar. Do you fold it in half and sew it together? It’s seems that it would be to tick to go with the lightness of the sweater? Thanks for the help I really want to make this. Hi! My name’s Penny and I’m from the south of Argentina. I’ve started to crochet thanks to you and your blog and instructions 😄 I did one of your boots with flip-flops patterns which came out fantastic and now everyone in my family wants a pair too (currently I’ve finished 4 different pairs) now I want to try this one to give my mom for her birthday. I think I have everything in the instructions figured out but I wanted to ask what SK stands for as it’s not in the abbreviations and glossary part. Thank you very much for all your awesome patterns! Sk stands for “skip” as in just skip whatever stitch the pattern is referring to. I’ll update the glossary now. Thanks for pointing that out! I have always wanted a shrug with actual sleeves so I was very excited to see your pattern! However, you say to use a hook size of “I-6mm”, and I can’t find this size hook. My I hooks are 5.5mm, my J hook is 6mm. Which should I use? Oh yes, that’s an error on my part. Thanks so much for pointing it out. It should say 5.5 mm (which is an I). I hope you enjoy making your shrug! Jess thank you for sharing all your awesome patterns!! It brings my so much joy! Thanks for your support, Laurie! 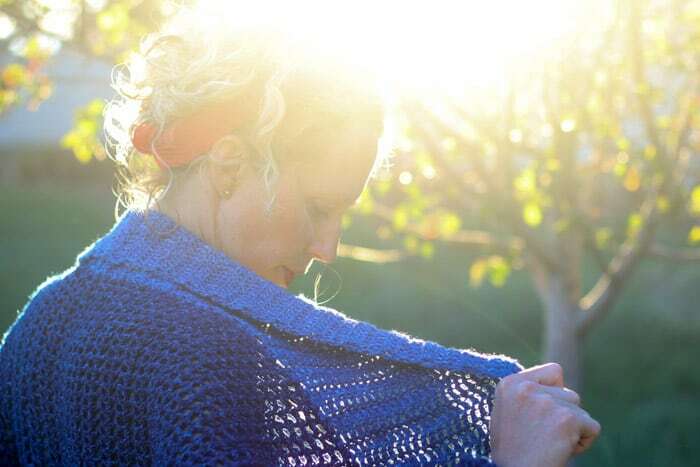 Hello Jess, love the easy crochet shrug. Just wonderful; i love the look of the fitted sleeves! Thanks for sharing all that you do! Hi! 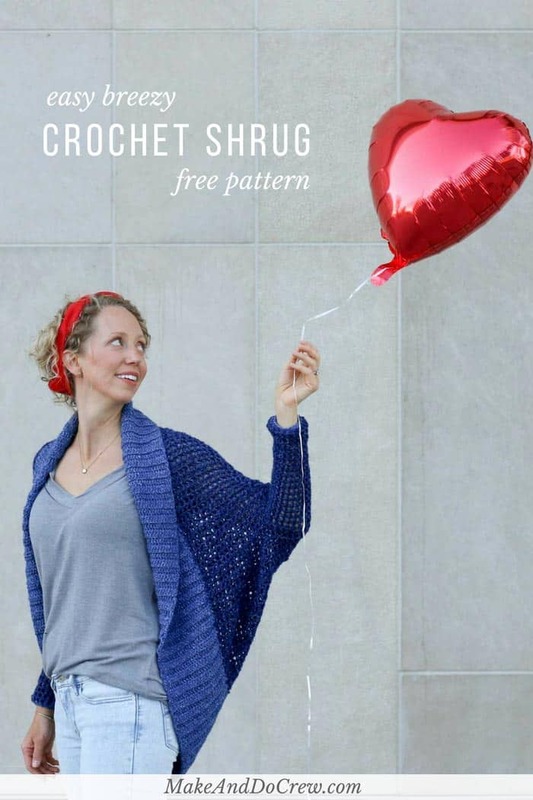 I have just learned how to crochet, and after making your adorable amigurumi cupcake, I wanted to try this shrug. I’m having trouble though interpreting the instructions for row 1 of the body rectangle. I have completed the initial instructions in row 1, but the “54 (62) ch1sp” at the end of the sentence is throwing me off. Am I supposed to do a single crochet in each space? Or is it still following the pattern in row 1, where I would sk 1 chain, ch 1, and double crochet into the chain space? Congrats on learning to crochet! That (54 (62) ch1sp) reference is just to how many little “windows” should be in your Row 1 from all the ch1sps you created in Row 1. Does that make sense? I love this pattern! I’m new to crochet having knitted for several years. I have a question about the gauge. Do I need to do two swatches, one for the 8 rows of dc=4″ and one for the 8 sets of (1 dc and 1 ch)=4″? Or is this just making one swatch with 8 rows of 8 sets of 1dc and 1ch? I hope this makes sense!! Thanks for your help! Hi Jess, I’m doing it in L, the first row says 62 spaces, and to work up to I think 81 spaces? Where in the pattern is there an increase?? The main portion is row 1, then repeat row 2 for x amount of rows, and at the end you should have an increase? 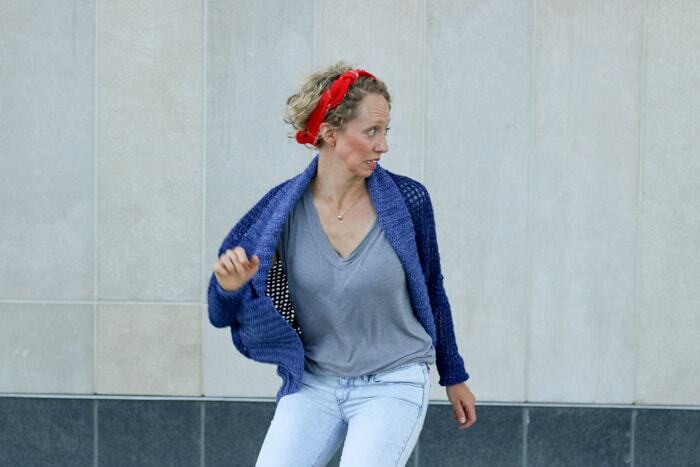 I don’t see where the stitches are added, just a little confused, love this shrug, ty! Yeah, I can see how that might be confusing. You’re right, you don’t increase at all. The first number of spaces is referring to the width of your rectangle, so each row you work should have 62 spaces. The second number is the vertical spaces, so once you’ve worked all the rows, you should have 81 spaces. Great question. You are correct. The width is increasing. And the chsps are exactly what you thought–those little windows across the width of your rows. I have such a ridiculous question. 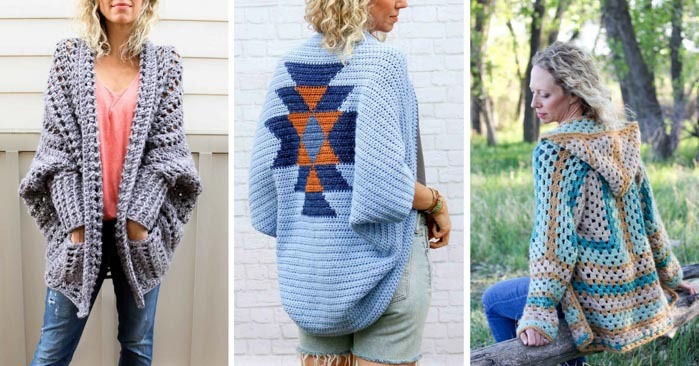 I am new to crochet and want to have a shrug done by the winter hopefully (haha) if I am buying off of the website do I need to by 7 individual packs of yarn? Thank you anyone for your help so excited to start! Haha, I have ridiculous questions daily. 🙂 So, yes, you need to buy however many balls of yarn the pattern size calls for. So in the case of a L/XL, you’d want four skeins of the main color (MC) and three skeins of the accent color (AC). If you are making a S/M, you’ll need 3 of the MC and 2 of the AC. Hope that is helpful! Send all your ridiculous questions my way! I’m new to crochet having knitted for several years. I have a question about the gauge. Do I need to do two swatches, one for the 8 rows of dc=4″ and one for the 8 sets of (1 dc and 1 ch)=4″? Or is this just making one swatch with 8 rows of 8 sets of 1dc and 1ch? I hope this makes sense!! Thanks for your help! Hi Jess, I made one similar last year but like this with the sleeves so much better. Thanks for sharing! Maybe I’m just reading it wrong but I don’t understand the line “Attach AC in any ch1sc around sleeve.” for the end of the sleeve. So I attach the accent color, I assume I chain 1, then do I sc in each dc around or in each ch1 sp or both? Because then the next row is sc in each ch1 sp but how am I making spaces from the row above. Again, sorry for sounding so dense! Thanks! I’m so happy to hear you’re excited to wear this! Are you referring to the end of the sleeve with your question? If so, I think the confusion might lay in the face that the second round isn’t single crocheted in the ch1sp, but instead in the sc. Round 2: Ch 1, sc in same sp, sc in each ch1sp around sleeve, sl st to first sc to join. Round 3: Ch 1, sc in each sc to end of round, sl to to first sc to join. Fasten off. Never mind my previous question. I figured it out. If you take a look through the pattern, I’ve included lots of notes on customizing it for your body based on taking your own measurements. If you read those and still have specific questions, let me know! I am having a little problem and need your advice. I made my swatch to check my gauge. I had to go up toa 6.0mm hook but was at the measurements called for. After making my chain and Row 1, I am only measuring 31″, instead of the 35.5″ for the small. Any suggestions? I counted my ch1sp and I do have the 54 called for. I would greatly appreciate any suggestions you may have. I love this pattern and would really like to make it. Thanks for your help!! I don’t understand the seaming on my rectangle. I find the pictures confusing. Do you have a video to show it? I have my 71 rows completed and I’m ready to make my sleeves. Thanks. I love your design. I’m still new to learning to read pattern and crocheting. This will be the second one I’ve tried. Just can’t seem to get past the second and third row. It’s turning into a ruffle lol One day I’ll figure it out. I think it’s great that you’re learning to read patterns. It sounds like maybe you’re adding some stitches as the rows progress, which would account for the ruffles. It could be helpful to count your stitches at the end of each row for a few to make sure the count is staying consistent. If there’s anything else I can do to help troubleshoot with you, please let me know! Hmm. I’m not sure I’m totally understanding your question. Are you referring to the seam on the actual sleeve? The sleeve is worked in the round, so after you sew the rectangle together, you’ll pick up stitches around the armhole and then work in the round to make the sleeve. Does that make sense? Hey Jess! 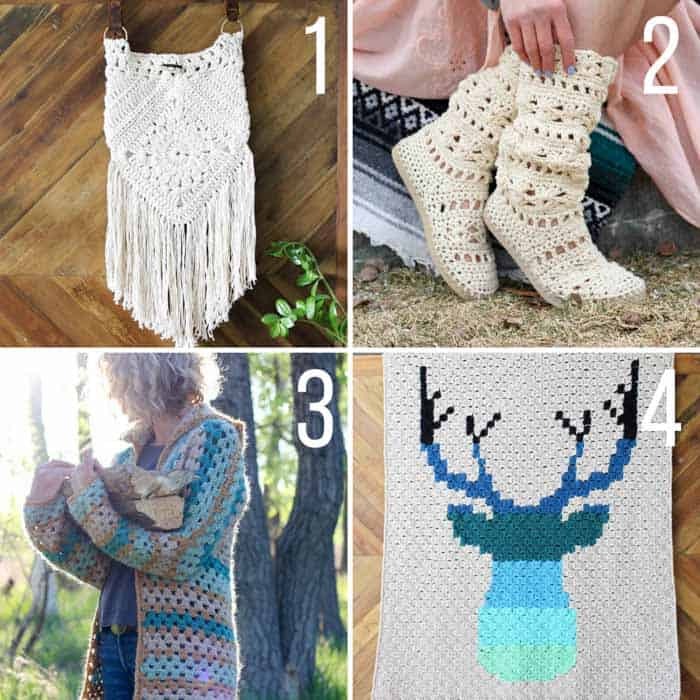 Have you or any of you followers tried this pattern with Lion brand Mandala yarn? I love this pattern and Mandala yarn. I’d love any tips or hints or tips anyone has for substituting the yarn. THANKS! Hi! So after a LOT of consideration i’ve decided to give thisp project a try and see if I can finally be patient enough and make a piece of clothing:) unfortunately i think i already made an irreversible mistake.. i didnt calculate my first rectangle right and my beggining chain is only 25 inches long. Do you have an idea of how i can fix this? I’m already almost 2 hours into this project and I dont have the heart to start all over again :/ will appreciate any advise! Thank tou so much! I am unable to find a tutorial for the shrug on your website. The instructions gave an address, but it Doe not show the shrug. I could really use a little visual assistance 😀. Thank you. I have the complete kit. What I would like is the tutorial that is mentioned at the bottom of. the cover page of the instructions. Can you help me find the tutorial? Hello! Do the “balls” equal skeins? So I would need 4 skeins of main color? Or is it the 246 yrds total?? Thank you!! Yes! Balls = skeins. Four skeins of the main color. 🙂 Thanks for clarifying! I just finished my shrug and I love it! I’m 5’3″ and had to reduce the rectangle to 50 rows wide so it won’t hang to the back of my knees due to the weight of the collar though. I had to undo several rows but the resultmis just great! quite proud of myself as I started crochet last spring…thanks for the pattern! Jess, thanks for the awesome pattern! I just finished the shrug and am enjoying wearing it while drinking some tea on this 65 degree morning. Your directions were very well written & easy to follow. I wanted a more neutral color so I used Big Twist yarn in Oatmeal. I think it’s a bit less drapy than the Lion Brand you used but I still love it! Thanks again. What that means is that if you held one of each of the two longer sides in each hand and brought them together to fold the rectangle in half, you’d be good. So the two side edges (instead of the chain row and the final row) should be touching. The best photo that depicts this is probable the one with the measurements on it. Yes!! Thank you! I just needed a light bulb moment!! Okay. I lied. I’m still not sure of the process. Once I have folded overy the long sides, do I do the “side seam” in the foundation and end rows or the long sides. And where do I start? Hello! Absolutely love this pattern! Thank you so much for it! I’m making it for my grandmother. I am confused while continuing round two. At the end of row two after you dc into the last dc you ask to dc into to turning chain before you dc into turning chain do you chain one? Please help!!!! I also have another question. When it come to seaming the rectangle; do I seam along the long horizontal side or do I seam along the shorter vertical seam? I’m sorry I just get confused so easily. I’m confused on this as well. Are the long sides touching or the short sides? And then what am I seaming together? Fold the rectangle length-wise so that the longest sides are touching. 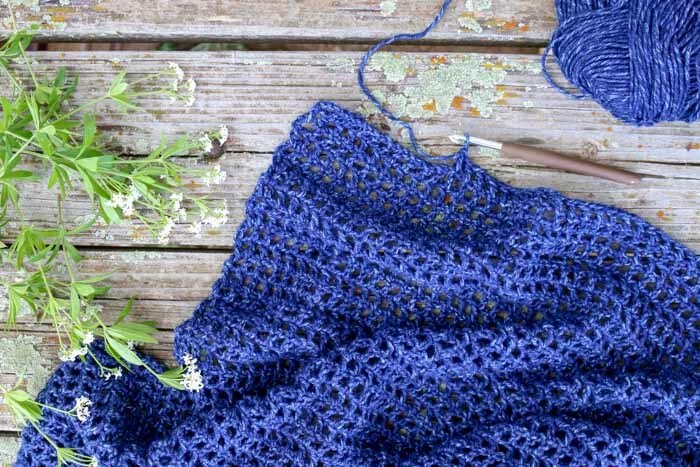 You are then seaming along the short sides starting at the two corners that are touching and working toward the folded edge, leaving a portion unworked near the fold for the armhole. You’ll repeat this again on the second side. Taking a close look at the photo at the top of the pattern as well as the one near the seaming section might be helpful too. Lmk if that doesn’t make sense and I’ll try to explain differently. Hello! This is such a cute pattern. I have started on one for myself and would like to make another for a friend before November 15. About how long did it take you/anyone else that sees this to make the shrug? I know I’m not nearly as quick but I’d like to have a rough estimate of how long it’ll take. Thanks! The best I can remember is that I made this in about a week, crocheting probably 2-3ish hours a day. I hope that’s helpful to you! On the sleeves your pattern says to “Attach AC in any ch1sc around sleeve.” Then goes to round 2. Is there nothing else that needs to be done in round one? Haven’t crochet in many many years and when I saw this shrug pattern and how easy it sounded I wanted to try it. I am having a problem with the sleeve instructions ,however. I have it folded according to the picture and this is where I’m confused, it says sew side seam using the mattress stitch until 20 (_26) ch1sps remain in armhole. Do I start to seam from the top edge or at the fold? If I leave 26 spaces for the armhole that leaves me with a big armhole, is this correct? Also, do I stay with the MC for the sleeves? You do use the main color for the sleeves. 🙂 You begin the seam from the open edge and work toward the folded side (although you’ll stop before you reach it.) The armhole shouldn’t be super big–you can sort of see in some of the photos, it’s about big enough to fit around a forearm. Hope that’s helpful! I’ve made several of your flip flop patterns. LOVE THEM! I’m making the stonewash Shrug, but I’m going to call this one a Hug. Because my adult daughter is going through a rough time right now, and I want her to feel a Hug when she wears it. Aw, I LOVE that idea! What a sweet momma you are. Please add some additional pictures. I am a experiences crocheter and this is not clear from the sleeve to the end.